I said I would post a vegetarian recipe, I don’t know if this counts, but this is as close as I can get to vegetarian. I love smoking food. I’ve only used a cedar plank in the past, but once I have my cottage built I’m going to pick up a smoker… I can’t wait. Give this recipe from the LCBO a shot with some grilled asparagus and rice. Cooking salmon on a cedar plank is a very old method of cooking. Originally it would be cooked over an open fire but barbecues have simplified this technique. Soak the plank in water for 30 minutes before using, otherwise it will burn. Salt the plank before using it to give the skin real flavour. 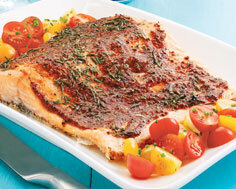 The marinade for this salmon goes well with beer – it has a slight BBQ sauce-like tang. 1. Combine mustard, ketchup, rosemary, olive oil, chili powder, salt and pepper. Spread over salmon and marinate for 30 minutes. 2. Heat grill to high heat. 3. Place soaked cedar plank on grill and leave for 3 to 4 minutes or until you can smell or see smoke. Immediately turn plank, salt it liberally and place fish on top, skin-side down. 4. Close cover and cook for 12 to15 minutes or until fish is just cooked. Remove plank from grill and slip salmon off, onto serving platter.